Galápagos is a bucket list destination for many travelers, but not everyone has the luxury of time to commit to an extended voyage. Now for the first time in Lindblad Expeditions’ 50+ years of bringing citizen explorers there, they are offering brand-new, shorter itineraries. Dr. Sylvia Earle, marine biologist and Explorer-in-Residence at the National Geographic Society, will join the first two Wild Galápagos Escape voyages as special guest speaker. Named one of Time magazine’s “Heroes for the Planet,” Sylvia is former chief scientist for the National Oceanic and Atmospheric Administration and founder of SEAlliance, which partnered with National Geographic on Mission Blue to further global initiatives aimed at restoring health and productivity to the ocean. She will join the November 24 and 29, 2018 voyages. 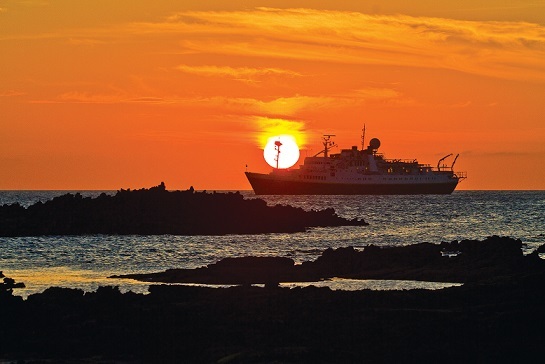 The other departures for Wild Galápagos Escape include April 27; May 2, 11, 16; August 31; September 5, 14, 19, and October 31, 2019. Rates begin at $5,450 per person based on double occupancy in a category 1 cabins. Hotel del Parque: Guests booked on National Geographic Islander will stay at the Hotel del Parque in Guayaquil, an elegant boutique hotel set along the banks of the Río Daule. Housed in a lovingly restored 19th-century building nestled within the secluded haven of Parque Histórico’s lush botanical gardens, it is a fitting retreat to an expedition aboard the yacht-scaled National Geographic Islander. Guests can enjoy after-hours access to the Parque’s botanical and zoological exhibits; the Museo del Cacao y del Chocolate; the cobble streets lined with colorful, historic buildings; and the verdant grounds, where the chatter of macaws and spider monkeys replace the sounds of a busy port city. With just 44 beautifully appointed rooms, two courtyards, a 19th-century chapel, and a gourmet café facing the river, this serene tropical refuge will elevate guests’ Galápagos experience.